What happens when you boot? What exactly happens when you start up your system depends on the hardware; this chapter gives a general description. You need to log in as root in order to change any of the files that the system runs when it starts up. When you boot your system, the CPU is reset, and it executes whatever is at its reset vector. This is usually a BIOS on x86 boxes, but on other platforms it might be a ROM monitor, or it might be a direct jump into some IPL code for that board. After a ROM monitor runs, it generally jumps to the IPL, and a BIOS might do this as well — or it might jump directly to the start of the OS image. The IPL copies the boot image into memory and jumps to the startup. The startup code initializes the hardware, fills the system page with information about the hardware, loads callout routines that the kernel uses for interacting with the hardware, and then loads and starts the microkernel and process manager, procnto (which, starting with release 6.3.0, also manages named semaphores). IPL and startup for a board are generally part of a Board Support Package (BSP) for a particular board. After procnto has completed its initialization, it runs the commands supplied in the boot script, which might start further customization of the runtime environment either through a shell script or through some program written in C, C++, or a combination of the two. On a non-x86 disk-booted system, that's pretty well how it happens: most customization is done in the boot script or in a shell script that it calls. For more details, see Making an OS Image in Building Embedded Systems . Booting a Neutrino system with an x86 BIOS. After gaining control, the BIOS configures the hardware, and then it scans for BIOS extension signatures (0x55AA). It calls each BIOS extension (e.g. a network card with a boot ROM or hard disk controller) until one of them boots the system. If none of the BIOS extensions boots the system, the BIOS presents some (usually strange) failure message. For the network boot case, the boot ROM (usually bootp) downloads an image from a server, copies it into memory, then jumps to the start of the image. The boot image generally needs to run a network stack, and starts some sort of network filesystem to retrieve or access additional programs and files. You can use the mkifs utility to create the OS image. For a sample buildfile for this sort of image, see the Examples appendix. After a short timeout, it boots whatever OS system is in the partition prompted for. This loader is /boot/sys/ipl-diskpc1. You can write a loader onto a disk by using dloader. When you choose a QNX partition, the secondary boot loader (sometimes called the OS loader) starts. This loader is Neutrino-specific, resides on the QNX partition, and depends on the type of filesystem. For a Power-Safe (fs-qnx6.so) filesystem, the secondary boot loader validates the filesystem and locates the most recent stable snapshot. It then presents all appropriate files from the .boot directory as a scrolling list, from which you can select the required boot image. If the .boot directory contains only a single applicable file, it's booted immediately; otherwise, the loader pauses for 3–4 seconds for a key press. You can use the up and down arrows to move from one file to another, and press Enter to select it. You can also press Home and End go to the extremes of the list. At most 10 files are displayed on the screen; to see more files, keep pressing the up or down arrows to make the list scroll. You can update the boot loader to a newer version without reformatting (or losing the the filesystem contents), by using mkqnx6fs -B. You can boot only little-endian filesystems (i.e. those formatted with mkqnx6fs -el on any machine, or natively formatted on a little-endian platform with an unspecified endian-ness). The boot loader supports only two indirect levels of block hierarchy; since with a 512-byte block, the cutover is at 128 KB, it is likely that filesystems formatted with mkqnx6fs -b512 won't be bootable. With a 1 KB block (the default), the cutover is at 1 GB. The BIOS doesn't support INT13 LBA extensions. The filesystem isn't an fs-qnx6 one, or the .boot directory is empty. The selected file isn't an x86 startup boot image. A physical I/O error occurred while reading the disk. A physical RAM error occurred while copying the boot image. No OS signature was found. An error occurred reading the disk. The only difference between the default installed images is that /.boot uses DMA for accessing the EIDE controller, while /.altboot doesn't. If you modify your boot image, it's a good idea to copy your working image from /.boot to /.altboot, then put your new image in /.boot. That way, if you make a mistake, you can press Escape when you next boot, and you'll have a working image for recovery. # Start 4 text consoles buy passing "-n4" to "devc-con"
This script starts the system by running diskboot, a program that's used on disk-based systems to boot Neutrino. For the entire qnxbasedma.build file, see the Examples appendix. You can pass options to diskboot (to control how the system boots) and even to device drivers. In this buildfile, diskboot passes the -n4 option to devc-con and devc-con-hid to set the number of virtual consoles. You can set up your machine to not use diskboot. For a sample buildfile, see the Examples appendix. The diskboot gives you the opportunity to update the devb-* drivers on your system. For more information, see “Updating disk drivers,” later in this chapter. The main script for initializing the system is /etc/system/sysinit; you usually keep local system initialization files in the /etc/rc.d directory. For example, if you want to run extra commands at startup on a node, say to mount an NFS drive, you might create a script file named rc.local, make sure it's executable, and put it in the /etc/rc.d directory. For more information, see the description of rc.local later in this chapter. It starts the system logger, slogger. Applications use slogger to log their system messages; you can use sloginfo to view this log. Next, diskboot runs seedres to read the PnP BIOS and fill procnto's resource database. For more information about this database, see rsrcdbmr_attach() in the Neutrino Library Reference . Then, diskboot starts pci-bios to support the PCI BIOS. After that, diskboot starts devb-eide or other disk drivers. If you want to pass any options to devb-eide or other drivers, pass them to diskboot in your buildfile. These are mounted as /fs/cdx for CD-ROMs, and /fs/hdx-type-y, where x is a disk number (e.g. /fs/cd0, /fs/hd1), and y is added for uniqueness as it counts upwards. For example, the second DOS partition on hard drive 1 would be /fs/hd1-dos-2. By default, one QNX 4 partition is mounted as / instead. This is controlled by looking for a .diskroot file on each QNX 4 partition. If only one such partition has a .diskroot file specifying a mountpoint of /, that partition is unmounted as /fs/hdx-type-y and is then mounted as /; if more than one is found, then diskboot prompts you to select one. The .diskroot file is usually empty, but it can contain some commands. For more information, see below. Optionally, diskboot runs the fat embedded shell, fesh. Next, diskboot starts the console driver, devc-con-hid (QNX Momentics 6.3.0 Service Pack 3 or later), or devc-con (earlier releases). They're similar, but devc-con-hid supports PS2, USB, and all other human-interface devices. Finally, diskboot runs the main system-initialization script, /etc/system/sysinit. a 0-length file. This is the default, which requests a mountpoint of /. The line must not start with a number sign (#) or contain an equals sign (=). The diskboot program ignores any leading and trailing whitespace. The diskboot program ignores any whitespace at the start and end of the line, and on either side of the equals sign. For more information, see the documentation for mount and specific drivers in the Utilities Reference , and mount() and mount_parse_generic_args() in the Neutrino Library Reference . The diskboot program recognizes and parses these tokens, but it currently ignores the information. The diskboot program recognizes the strings qnx4, ext2, and dos, but currently ignores this token. It determine the type based on partition numbers, as described for diskboot, above. The /etc/system/sysinit file is a script that starts up the main system services. In order to edit this file, you must log in as root. Before you change the sysinit script, make a backup copy of the latest working version. If you need to create the script, remember to make it executable before you use it (see chmod in the Utilities Reference ). It starts slogger, if it isn't yet running. The script starts the pipe manager, pipe. This manager lets you pass the output from one command as input to another; for more information, see “Redirecting input and output” in Using the Command Line. Next, sysinit starts mqueue, which manages message queues, using the “traditional” implementation. If you want to use the alternate implementation of message queues that uses asynchronous messaging, you need to start the mq server. For more information, see the Utilities Reference . Starting with release 6.3.0, procnto* manages named semaphores, which mqueue used to do (and still does, if it detects that procnto isn't doing so). If this is the first time you've rebooted after installing the OS, sysinit runs /etc/rc.d/rc.setup-once, which creates various directories and swap files. Next, sysinit sets the _CS_TIMEZONE configuration string to the value stored in /etc/TIMEZONE. If this file doesn't exist, sysinit sets the time zone to be UTC, or Coordinated Universal Time (formerly Greenwich Mean Time). For more information, see “Setting the time zone” in Configuring Your Environment. If /etc/rc.d/rc.rtc exists and is executable, sysinit runs it to set up the realtime clock. We recommend that you set the hardware clock to UTC time and use the _CS_TIMEZONE configuration string or the TZ environment variable to specify your time zone. The system displays and interprets local times and automatically determines when daylight saving time starts and ends. This means that you can have dial-up users in different time zones on the same computer, and they can all see the correct current local time. It also helps when transmitting data from time zone to time zone. You stamp the data with the UTC time stamp, and all of the computers involved should have an easy time comparing time stamps in one time zone to time stamps in another. If you're using Photon, you can just uncheck The hardware clock uses UTC/GMT in phlocale; if you do that, the program creates a rc.rtc file for you that contains the above command. After setting up the clock, sysinit sets the HOSTNAME environment variable to be the name of the host system. It gets this name from the hostname command, or from /etc/HOSTNAME if that doesn't succeed. Then, sysinit runs /etc/rc.d/rc.devices to enumerate your system's devices (see “Device enumeration,” below). This starts io-pkt* as well as various other drivers, depending on the hardware detected. If /etc/system/config/useqnet exists and io-pkt is running, sysinit initializes Neutrino native networking (see the Using Qnet for Transparent Distributed Processing chapter in this guide, and lsm-qnet.so in the Utilities Reference ). Next, sysinit runs the system-initialization script, /etc/rc.d/rc.sysinit (see below). If that fails, sysinit tries to become a sh or, if that fails, a fesh, so that you at least have a shell if all else fails. Neutrino uses a device enumerator manager process, enum-devices, to detect all known hardware devices on the system and to start the appropriate drivers and managers. It's called by the /etc/rc.d/rc.devices script, which /etc/system/sysinit invokes. The enum-devices manager uses a series of configuration files to specify actions to take when the system detects specific hardware devices. After it reads the configuration file(s), enum-devices queries its various enumerators to discover what devices are on the system. It then matches these devices against the device IDs listed in the configuration files. If the device matches, the action clauses associated with the device are executed. You can find the enumerator configuration files in the /etc/system/enum directory. For example, the /etc/system/enum/devices/net file includes commands to detect network devices, start the appropriate drivers, and then start netmanager to configure the TCP/IP parameters, using the settings in /etc/net.cfg. Set sernum to the next unique serial device number, starting at 1. Start the devc-ser8250 driver with the provided options (the device enumerator sets the ioport and irq variables). The enumerator reads and concatenates the contents of all configuration files under the chosen directory before it starts processing. For details on the different command-line options and a description of the syntax for the configuration files, see enum-devices in the Utilities Reference . If you're an OEM, and you've written any device drivers, create an oem file or directory under /etc/system/enum to contain the definitions for the devices. If you need to set up devices or options that are specific to your particular system configuration, create an overrides file or directory under /etc/system/enum. The enumerator includes the overrides file or directory last and adds any definitions in it to the set that enum-devices works with. If the overrides file has something that a previously included file also has, the later definition wins. If io-pkt* isn't running, start it. IOPKT_CMD is a macro, defined in /etc/system/enum/include/net, that specifies the default io-pkt* command line. Set netnum to the next unique network interface device number, starting at 0. Mount the PCNET driver into io-pkt*. The second block of code tells the enumerator to do nothing if it detects devices 2002 or 2003 from vendor 1234. When you add device entries to prevent devices from being enumerated, make sure that there aren't any action clauses after them. Any group of actions clauses found after any single or set of device entries is used for those devices. Place these device entries at the end of your overrides configuration file. To further customize the enumerators for your system configuration, you can create a /etc/host_cfg/$HOSTNAME/system/enum directory. If this directory structure exists, the rc.devices script tells the enumerators to read configuration files from it instead of from /etc/system/enum. Even if you have a /etc/host_cfg/$HOSTNAME/system/enum directory, the enumerator looks for an oem directory and overrides file under /etc/system/enum. An easy way to set up the directory is to copy the /etc/system/enum directory (including all its subdirectories) to your /etc/host_cfg/$HOSTNAME/system directory and then start customizing. The /etc/system/sysinit script runs /etc/rc.d/rc.sysinit to do local initialization of your system. It starts a secure random-number generator, random, to provide random numbers for use in encryption and so on. 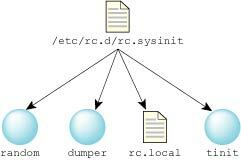 If the /var/dumps directory exists, rc.sysinit starts the dumper utility to capture (in /var/dumps) dumps of processes that terminate abnormally. If /etc/host_cfg/$HOSTNAME/rc.d/rc.local exists and is executable, rc.sysinit runs it. Otherwise, if /etc/rc.d/rc.local exists and is executable, rc.sysinit runs it. There isn't a default version of this file; you must create it if you want to use it. For more information, see “rc.local,” below. Finally, rc.sysinit runs tinit. By default, the system starts Photon, but if you create a file called /etc/system/config/nophoton, then rc.sysinit tells tinit to use text mode. For more information, see “tinit,” below. As described above, rc.sysinit runs /etc/host_cfg/$HOSTNAME/rc.d/rc.local or /etc/rc.d/rc.local, if the file exists and is executable. You can also use rc.local to slay running processes and restart them with different options, but this is a heavy-handed approach. Instead of doing this, modify the device enumeration to start the processes with the correct options. For more information, see “Device enumeration,” earlier in this chapter. Note that you have to put your password as plain text in your rc.local, but presumably you aren't concerned with security if you want to bypass the login prompt. The -O option to phlogin brings you back to text mode when you terminate your Photon session; without the -O, pressing Ctrl-Shift-Alt-Backspace simply logs you in again. For more information, see login in the Utilities Reference . Don't use the rc.local file to to set up environment variables, because there's another shell that starts after this script is run, so any environment variable that you set in this file disappears by the time you get a chance to log in. If the -p option is specified, tinit starts Photon. Otherwise, tinit looks at /etc/config/ttys and runs login or shells, based on the contents of the file. For more information, including a description of /etc/config/ttys, see tinit in the Utilities Reference . The Neutrino boot process can dynamically add block I/O (i.e. disk) drivers, letting you boot on systems with newer controllers. The mechanism is simple and not proprietary to QNX Software Systems, so third parties can offer enhanced block drivers without any intervention on our part. The file name of the driver. The string for the boot process to display when trying the driver. The total time to wait for devices. Any additional arguments to the driver (e.g. blk cache=512k). The configuration file must be called drivers.cfg, and you must supply the update on a physical medium, currently a CD-ROM or a USB flash drive. The boot process looks in the root of the filesystem first, and then in a directory called qnxdrvr. This can help reduce clutter in the root of the filesystem. If the update is distributed over the web in zip or tar format with the qnxdrvr structure preserved, an end user simply has to download the archive, unzip it to a USB drive, and insert the USB drive on booting. You can apply a driver update by pressing Space during booting and selecting F2. The system then completes the startup of the standard block drivers, giving a source filesystem to apply the update from. You're then prompted to choose the filesystem and insert the update media. If you need to rescan the partitions (for example, to find a USB drive that you inserted after booting), press F12. Once the files have been copied, you're prompted to reinsert the installation CD if applicable. The block drivers are then restarted. This mechanism also lets you update existing drivers or simply modify their arguments (e.g. PCI ID specification). If you're installing, then the installation program copies the updated drivers to /sbin and the configuration file to /boot/sys. It then makes copies of the standard build files in /boot/build (except multicore ones) and calls them qnxbase-drvrup.build and qnxbasedma-drvrup.build. These files are then used to create new image files called qnxbase-drvrup.ifs and qnxbasedma-drvrup.ifs in /boot/fs. The DMA version of this new file is copied to /.boot, and the non-DMA version is copied to /.altboot. The installation program doesn't rebuild multicore (SMP) images. Boot the machine and apply the driver updates. Copy the new devb-* drivers to /sbin. Copy drivers.cfg to somewhere under /. If you put it in a directory that's in the mkifs search path (e.g. /sbin, /boot/sys), mkifs will find it automatically. Copy the build file (typically qnxbasedma.build) to driverupdate.build. Add the names of the new block drivers (devb-*) after devb-eide. You can use qnxbasedma.ifs (or one of the other original boot images) if you run into problems. The applications I put in rc.local don't run. Make sure that the executable is in a directory that's included in the PATH environment variable as it's defined when the system executes /etc/rc.d/rc.local. I messed up my rc.local file, and now I can't boot. Boot from CD and correct your rc.local file. Boot your system into “debug shell” mode: press Space during booting up, then press F5 to start the debug shell.